The AKN has a total of nine Nodes associated with it. These Nodes are simply webpages that offer information, products and tools specific to addressing the particular questions or needs of a particular audience or group. Each Node is connected to the greater umbrella AKN system. Therefore, data entered into each individual node is accessible to and shared with the AKN system and fed into the AKN Core tools such as the Data Catalog, as well as the Data Downloader, Phenology Graph and Observations Map if the data owners share the data at a Data Sharing Level of Level 2 or above. Following the last update to the AKN, which occurred with the development of the Federal Avian Data Center, data entry tools found in individual nodes are the same tools found on the Upload, Enter and Manage Your Data webpage, and connect to the same back end database. Therefore, you do not necessarily have to go to the node that matches the geographic area of your dataset to enter your data. Unless you have been instructed otherwise, you may follow the instructions on the Upload, Enter and Manage Your Data webpage to enter and manage data from anywhere within the geographic boundary of the AKN. If you’re not sure where or how to enter your data, please contact an AKN representative. The following is a list of the AKN Nodes. To view a menu of the unique features of each node visit the AKN Site Map. Avian Knowledge Northwest (AKNW) provides data-driven decision support system for scientists, natural resource managers, and other individuals interested in advancing bird and habitat conservation in the northwestern United States. The vision is that AKNW will become the region’s leading avian information decision support system for professionals engaged in bird conservation and natural resource management, thereby advancing bird and habitat conservation in the Pacific Northwest. The Borderlands Avian Data Center (BADC) is a partnership of people and organizations working to improve bird and habitat conservation in the southwestern U.S. and northern Mexico. BADC brings together researchers and managers to coordinate bird-monitoring efforts. It provides a platform for data organization, sharing and coordination of standardized monitoring efforts, as well as data analysis and visualization tools. It is the only bi-nationally managed and bilingual node (in Spanish). The California Avian Data Center (CADC) integrates data on birds and ecosystems in California to improve conservation outcomes today and in the future. CADC features a variety of decision support tools addressing current and future avian habitat and species status and distributions throughout the state of California. 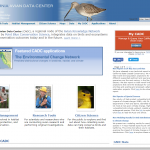 The Eastern Avian Data Center (EADC) was developed to cover the Southeast and Northeast regions of the eastern United States. Due to lack of funding and continued maintenance, users may experience broken links and outdated information on this Data Center webpage. At this time the EADC site has no unique tools or information to offer. If you are looking to examine bird data from the eastern U.S. or put your data in this region in the AKN, you may use tools found on the primary AKN webpage to conduct these tasks. 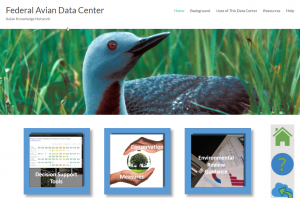 The Federal Avian Data Center (FADC) was funded and built by Federal agencies to help these agencies and their constituents implement informed bird conservation actions and comply with bird conservation laws. The website offers access to a variety of avian conservation decision support tools, information and resources that can be used to facilitate bird conservation and environmental review capabilities across county, state, regional, and international boundaries of the United States. 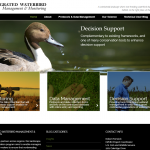 Integrated Waterbird Management and Monitoring (IWMM) node is a coordinated multi-partner monitoring program designed to inform and guide the management and conservation of migrating and wintering waterfowl, shorebirds, and waders in all four flyways. The IWMM database, housed in and connected to the AKN, supports managers and partnerships by enabling users to maintain scientific data on a secure site, organize data for a greater range of analysis opportunities, and share data and technology that lead to cost efficiencies. In addition to supporting IWMM participants, the database also helps create and allow for iteratively updating decision support tools. 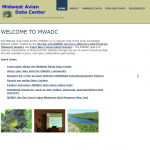 The Midwest Avian Data Center (MWADC) was launched in 2011 to serve as both a modern data management and decision support system that furthers strategic conservation of birds (and their habitats) in the Midwest U.S. 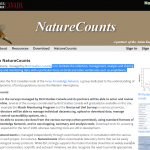 Nature Counts is the first Canadian node of the Avian Knowledge Network. The purpose of Nature Counts is to facilitate the collection, management, analysis and sharing of natural inventory and monitoring data, with a particular focus on birds and other vertebrates such as amphibians, reptiles and bats in Canada. 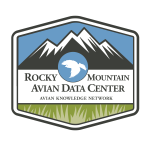 The Rocky Mountain Avian Data Center (RMADC) hosts Integrated Monitoring in Bird Conservation Regions (IMBCR) and other data collected by collaborators in the Rocky Mountains, Great Plains, and Intermountain West. It is intended to provide population estimates (both density and occupancy), approximate survey locations, and species counts to wildlife biologists, land managers, and other conservation practitioners who may use these data to inform management and conservation decisions. Population estimates are provided at a variety of scales and account for incomplete detectability of birds. The RMADC is hosted by Bird Conservancy of the Rockies and has been made possible through a broad partnership of state, federal, and non-governmental agencies.